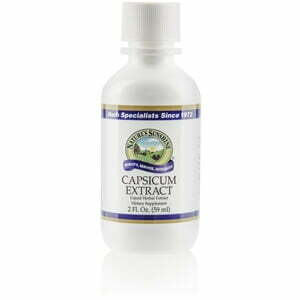 Nature’s Sunshine Capsicum Extract stimulates digestion and enhances blood flow. Capsicum (the genus name for “peppers”) was Nature’s Sunshine’s first product back in 1972 after founder Gene Hughes took Cayenne pepper powder by the spoonful to help his stomach. The capsicum used in this product contains 35,000-40,000 Scoville Heat Units (the level of heat for Cayenne pepper). 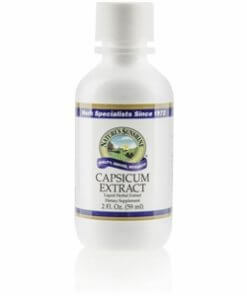 Nature’s Sunshine Capsicum Extract is a natural and pure liquid herb extract composed of the finest capsicum fruit with water and 15-20 percent alcohol. Instructions: Take approximately 10-15 drops (0.5 ml) in water with food four times daily. One ml is equal to two capsules of capsicum.